Before we conclude this module on “Futures Trading”, we must address one of the questions that is often asked- “What is Open Interest (OI)?”, “How is it different from Volumes?”, and “How can we benefit from the Volumes and Open interest data?” Let me attempt to answer these questions and more in this chapter. After reading this, you will be able to interpret OI data in conjunction with the Volumes to make better decisions while trading. Also, I would suggest you refresh your understanding on Volumes from here. Open Interest (OI) is a number that tells you how many futures (or Options) contracts are currently outstanding (open) in the market. Remember that there are always 2 sides to a trade – a buyer and a seller. Let us say the seller sells 1 contract to the buyer. The buyer is said to be long on the contract and the seller is said to be short on the same contract. The open interest in this case is said to be 1. Let me illustrate OI with an example. Assume the market consists of 5 traders who trade NIFTY futures. We will name them Arjun, Neha, Varun, John, and Vikram. Let us go through their day to day trading activity and observe how open interest varies. Please note, you need to exercise some patience while understanding the flow of events below, else you can quite easily get frustrated! 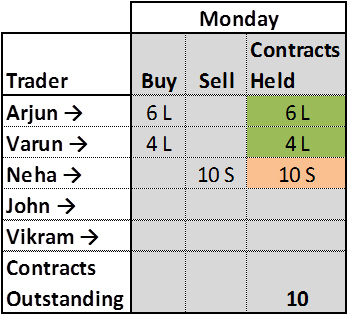 Monday: Arjun buys 6 futures contracts and Varun buys 4 futures contracts, while Neha sells all of those 10 contracts. After this transaction, there are 10 contracts in total with 10 on the long side (6 + 4) and another 10 on the short side; hence the open interest is 10. This is summarized in the table below. Tuesday: Neha wants to get rid of 8 contracts out of the 10 contracts she holds, which she does. John comes into the market and takes on the 8 shorts contracts from her. You must realize that this transaction did not create any new contracts in the market. It was a simple transfer from one person to another. Hence the OI will still stand at 10. Tuesday’s transaction is summarized in the table below. By the end of Wednesday, there are 15 long (9+6) and 15 short positions in the market, hence OI stands at 15! 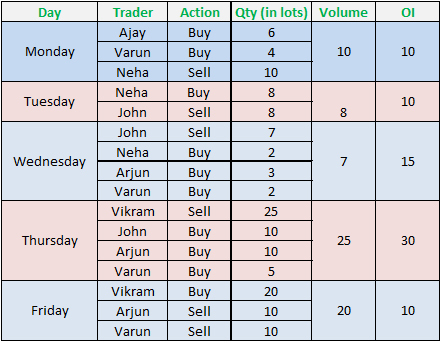 Thursday: A big guy named Vikram comes to the market and sells 25 contracts. John decides to liquidate 10 contracts, and hence buys 10 contracts from Vikram, effectively transferring his 10 contracts to Vikram. Arjun adds 10 more contracts from Vikram and finally Varun decides to buy the remaining 5 contracts from Vikram. In summary, 15 new contracts got added to the system. OI would now stands at 30. Friday: Vikram decides to square off 20 of the 25 contracts he had sold previously. So he buys 10 contracts each from Arjun and Varun. This means, 20 contracts in system got squared off, hence OI reduces by 20 contracts. The new OI is 30-20 = 10. The final summary is listed in the table below. So on and so forth; I hope the above discussion is giving you a fair sense of what Open Interest (OI) is all about. The OI information just indicates how many open positions are there in the market. Here is something you should have noticed by now. In the ‘contracts held’ column, if you assign a +ve sign to a long position and a –ve sign to a short position and add up the long and short positions, it always equates to zero. In fact this is one of the primary reasons derivatives is often termed as a zero sum game! As of 4th March 2015, OI on Nifty futures is roughly 2.78 Crores. It means that there are 2.78 crore Long Nifty positions and 2.78 crore Short Nifty positions. Also, about 55,255 (or 0.2% over 2.78Crs) new contracts have been added today. OI is very useful in understanding how liquid the market is. Bigger the open interest, more liquid the market is. And hence it will be easier to enter or exit trades at competitive bid / ask rates. Open interest information tells us how many contracts are open and live in the market. Volume on the other hand tells us how many trades were executed on the given day. For every 1 buy and 1 sell, volume adds up to 1. For instance, on a given day, 400 contracts were bought and 400 were sold, then the volume for the day is 400 and not 800. Clearly volumes and open interest are two different; buy seemingly similar set of information. The volume counter starts from zero at the start of the day and increments as and when new trades occur. Hence the volume data always increases on an intra-day basis. However, OI is not discrete like volumes, OI stacks up or reduces based on the entry and exit of traders. In fact for the example we have just discussed, let us summarize the OI and volume information. Notice how OI and volume change on a daily basis. Today’s volume has no implication on tomorrow’s volume. However, it is not true for OI. From a stand-alone perspective both OI and volume numbers are pretty useless. However traders generally associate these numbers with prices to draw an inference about the market. Do note, if there is an abnormally high OI backed by a rapid increase or decrease in prices then be cautious. This situation simply means that there is a lot of euphoria and leverage being built up in the market. In situations like this, even a small trigger could lead to a lot of panic in the market. And with this, I would like to conclude this module on Futures Trading. I hope you enjoyed reading through this module as much as I enjoyed writing it! On wards to Option Theory now! Abnormally high OI indicates high leverage, beware of such situations. Updated : 24th Aug 2016 – If you use intra day OI information as a critical input for your trading strategy, then you should read this before you trade. Please correct me if I am wrong. I am a price action day trader. I never used OI data till now. As per me, the trend changes when a valid pivot is broken. Suppose, a trend changing pivot is triggered with a decrease in OI. Does that mean, people are losing confidence in the trend and that makes the trend change more trustworthy?? Or, as the OI is decreasing which means people are not taking any positions in the new trend , hence its better to wait for the confirmation?? You can treat it that way…however another way to look at it is when OI increases it simply means there are too people betting on the same outcome. In fact I personally dont use OI much. Do we have any chart to monitor OI. Sir by what time we can expect this much needed service of open interest chart along with price in Kite ?? Its on the agenda, Prakash. We will do this sometime soon. I want you to check the topic”OI and Volume interpretation” from last chapter -‘open interest’ in the current (futures trading) module . There are some typing mistakes in the pdf document please correct it , as it is not convenient for everyone to read it online..please do it fast. Can you point them out, Pravin? Thanks. I had bought Nifty 8600 PE 20 lots @ 64, I found that it hit 74 @ 2:36PM when Nifty spot went to 8680.45 and Fut was 8716.25, I waited for another dip as Ididn’t get chance to square off there and I kept sell @ 72.2,but @ 2:54PM Nifty spot was @ 8677 and Fut @ 8714 still 8600PE went down only to 69.90!!!,why? finally I had to take loss @ 52.80. You might have hit a low vol scenario. Option prices drop will fall in volatility. This is a thing that amazes lot of option buyers who are new to the trading world. Check how nifty vix index moved during that time. Hi Karthik! Do you know of any good analysis software that offers the option of candles based on volumes (stocks/contracts) traded…as opposed to the usual time-based candles (weekly, daily, hourly)? Are there any plans to offer this on Pi? Most s/w including Pi offers something called as ‘Candle volume’ chart which combines candlestick and volumes. I will try and include a chapter based on this sometime soon. Will try and do that sometime soon, Vivek. Today DLF15MAR140CE traded @ 9.25 & DLF15MAR140PE traded @ 3.30 at around 10:30Hours and the spot price is 145. At the EOD Spot moved to 149.2, CE from 9.2 to 11.6 but put down from 3.3 to 2.25rupees. Eventhough the option is far away from the expiry but why the depreciation in PUT price? Suppose if i used the long straddle strategy chance of profit in both call & puts. Can you clarify? This depends on the sensitivity of the option’s premium to the directional move in the spot. The 140CE is deep ITM option, whose delta is close to 1, hence the option behaves very similar to spot. We will talk about this and more shortly in options. All these queries will be sorted for you. Request you to kindly stay tuned till then. Thanks. Can you provide the mail id to clarify the trading strategy related queries? Request you to kindly post your queries here, so that others too can benefit. Thanks. I want to clarify, you say Increase	in price and Increase in OI mean More trades on the long side. How is this possible if there is a seller for every buyer? As I’ve mentioned on a standalone basis OI information is pretty much useless…it is a perception that when OI increases and the price increases it is considered bullish. If not on standalone basis can we combine OI analysis with Indicators, charts for trading decision? OI is best when you look at it from the price perspective. But yeah, you also combine it with elements such as support and resistance. No. of long & shorts is same. However when both price and OI is increasing it means that the market is dominated by bulls. Is there any way to find option selling from option chain . PLEASE EXPLAIN THESE TERMS HIGHLIGHTED IN BLUE COLOUR. WHAT DOES THIS MEAN? Raju, all the terms related to volatility will be explained in the Options module…and honestly I really dont understand that cost of carry bit on NSE wbebsite, we even spoke to NSE about it, but I’m yet to understand it clearly. Will keep you posted as soon as I get an answer myself. Thanks. how can this be possible? i mean, don’t you think traded quantity (volume) must be at least change in open interest ????? Pravin – From my observation the real time OI data on NSE is not accurate, its best to check for end of day OI data. Having said that, remember the OI data is a carry forward number and changes each day of the series. Where as the volume is for the day (it only increases as the day progresses, where as OI can change). I have illustrated this in section 12.2 of this chapter. dear sir,, first of all this snap is taken at the END OF THE DAY (13th march 2015). and what i am trying to say is, on that day 65,60,000 contracts have been squared off.. so, logically that day’s trading volume must be atleast 65,60,000. please explain your opinion. thankyou. Yes, in fact if you see the traded volumes (expressed in number of contracts) is 7975, which is basically 7975 * 8000 = 6.38Cr shares…which is clearly way higher than the 65,60,0000 shares which were squared off. Cost of carry is simply the interest rate component in the futures pricing formula….expressed as Rf * (X/365). Thanks Shubha! We will probably have something for macro economic activities soon. Thank so much for the kind words. We have already started work on Options module, in fact the first chapter should be uploaded sometime today. Thanks. The first chapter on options should be out today, request you to kindly stay tuned. Thanks. IV of an individual instrument is just that – the instrument’s IV or the implied volatility. Will talk about volatility in detail in the options theory module. Great Work and Fantastic write up. You have taken so much time in explaining all the possibilities that I have understood on FUTURES trading much better than anyone who has tried to explain the same to be. how to trace sell or buy open interest and volume in a future contract ,what is future price discount ,why does it happen? As a intraday trader what are the charts or data that u watch closely before placing an order .Eg. I used to watch RSI , volumes and Total bid and ask quantity. In no particular order – Support Resistance, Candlestick patterns, generic dow pattern, overall sentiment in the market, overall sentiment in that particular stock, fundamental news scan, volumes, and moving averages. Honestly I have never seen this kind of write up anywhere. Hats off to u guys!! Karthik, Now i have covered the first four modules of varsity by finishing the futures module. 1. Am I good to go for trading in futures using TA checklist?. 2. Or Do I need to wait for other related modules such as Trading Psychology and Risk Management, Trading Strategies and System to be completed? 3. Do I need to complete Options module to select a good trade(to select either futures or options trade based on the conditions)? Nope, you should be good to go. If you have read all the 4 modules then please do not hesitate…its time to validate all that you have learnt. Initiate small and well planned trades…dont rush to put in big trades. Remember every trade has a lesson bundled within…make sure you recognize that lesson and learn from it. The key is to make sure you sustain your capital…dont burn it up by initiating large and reckless trades. If you are new, avoid day trading…try taking positions for 2 -3 days. We have interviewed some of the most successful traders here – http://zerodha.com/z-connect/category/zerodha-60-day-challenge . I would suggest you read this for some great inspiration. Good luck! The trading quantity can also be disclosed while placing an order. So, if I buy 2500 lots of nifty but don’t disclose any quantity at all (and similarly, the person who sells those 2500 lots also does not disclose any quantity), will either the volume or the OI change? Nope, the disclosed quantity is only to mask the trade for that particular order….end of day the exchange will take all orders in consideration irrespective of it being disclosed or not. Can you please suggest me a good book or source to learn about intraday trading strategies and concepts. No reliable book that I know of. Pavan – everything is correct expect that during the BAN period you cannot initiate a new position…you can only close out the existing position. Sir, iam a pivot high/low breakout trader in Futures only, till today I face big lose but top trader earn from same strategy in zerodha 60 day challenge only but I can’t, so I have doubt about entry and exit by using pivot high/low, suppose in intraday 10 minutes time frame, previous pivot high is broken after 12 o’clock then how can I use open interest and volume to confirm uptrend. Dilip – please do ensure that the volume bar for the pivot high/low candle is higher than the last 30 mins average. Honestly, this is the only thing I can think of at this point, hopefully this should help. Yes, you can even use 10 mins candles as well. hi Karthik, decrease in OI with a decrease in price is an indication of longs selling which is why the price falls. the interpretation commonly voiced is that, this is bullish. or, a bounce upwards is expected. the longs exit because the r booking profits as they feel the stock might not ride up any further. why bullish then? thanks. Not sure Madhu. Generally, decrease in OI + decrease in price indicates long positions are being unwound. hey karthik, the price of a stock increases on a day, along with that if we go through the percentage of deliverable trades to the traded volume, we may find it hinges at 30 to 40 %. now, the OI and the price would have increased at the same time. which means it was a trading counter. is that fair? then at times the price is up and the deliverable quantity is 100% but he OI has decreased and the price is up. this indicates short covering. since there is 100 % delivery , most would look to buy as is the norm but, there is short covering too and that means the sentiment is weak at that counter. is that a paradox? Not sure if we can mix the % deliverable figure with OI…while the former is wrt to spot market, the latter is wrt to Derivatives mkt. Hi karthik, an increase in OI with an increase in price indicates bullishness. However, doesn’t it also mean that an increase in OI of a particular strike signals the option sellers view that the price might not reach that strike ( since the option seller is more aware.) isn’t this a paradox? OI is formed only when a new position is created. This means number of contracts bought equals the number of contracts sold. Hence on a stand alone basis OI conveys very little info…therefor we associate price to derive some meaning. With respect to options there is a slightly different perspective…like I mentioned earlier this will be discussed in next module in Options Pain chapter. Can you please tell specifically where Madhu’s question has been addressed in options chapter? Well, the interpretation of ‘OI + Price’ is based on empirical study. You can add in a layer here and check how the OI of ATM options behave as ATM strike reflects the current sentiment in the market. Can you please let me know the results of the empirical study? If the OI gets added or subtracted from put chain , what does it mean? Data providers will give out the historical price, volume , and OI data. 1) Going through the modules and the queries from the readers I have found mention of Pivot every now and then. Could you please explain what is that. What does leveraging mean in Trading context? Vivek – please do not hesitate asking questions…this is the only way to enrich this forum! 1) Pivot levels are techniques used to calculate the Support and resistance level by employing a mathematical formula. Plenty of site give you this formula. 2) Leverage in this context means very high numbers of futures and options positions. This can be a bit dangerous since all F&O trades are leveraged. Means no trades in this contract! Sorry, but I think the above stats mean that whatever number of contracts were there, they are al now squared off. And the trades in which they squared off, counted towards 25 volume. OI basically represents the open contracts. The ones that are not squared off. In this situation what happend is, suppose 25 long contracts were squared off then 25 short contracts were added. Making the total 25-25=0. Hence no change in open interest. But volumes went up by 25 contracts. Yup, the way volume, and OI is calculated are different. Iam a nifty futures full time scalper from Tamilnadu. If so, can I rebate this paid 211.41 rupees/Lot.. Which mean if I done 75000Lots for the entire FY & the tax can be claimed max upto the level of 2.11Lakhs. Vasanth, little confused with ur question, can u look at this section, everything you need to know about taxation when trading. In trading, all costs can be shown as expense so that you pay taxes only on net profits. So if I am guessing ur question right, the answer is yes. If you are long on Nov Nifty futures…then closing the position on expiry and buying the Dec series is called rollover. The % depends on the current sentiment of the stock. Difficult to call the market direction just by looking at this info! i bit confused with oi, if a stock has 100 oi, then 4 traders enter to the market and create one short position each. so now oi is 104 right? , and after some time these traders exit from their current position so now oi is 100 right ? please correct me if i am wrong? Yes, as long as the 4 new sellers match with 4 new buys, the OI will goto 104. Once they square off the OI will drop back to 100. OI always captures the net open position in the market. Hi Karthik, as I could understand from above article, derivatives are zero sum game. So on start of a new future contract after expiry, how can a first buyer of contract initiate long if no sellers are on other side and viceversa. Pl explain. Its like going to the vegetable market the first thing in the morning…as soon as markets are open ppl will come to buy/sell something or the other…and hence a transaction takes place. are only delivery based futures trade possible in any segment ? what if i wish to capture calender spread buy 1 lot of nifty at 8000 in current month and sell it the next month at 8080? is doing this alone possible (without being bothered about intraday movements or squaring-off positions) ? Yes, you can carry forward futures positions overnight. When you create a spread like this, the full realization of profits happen upon expiry. This means to say that the position will have to be open throughout the series and therefore you will have to buffer for M2M P&L. 1) this can be done in futures itself without bothering about any kind delivery on demat side ? CRUDEMINI JAN is 2383 & CRUDEMINI FEB is 2455 .
i wish to capture the spread of 72 points by buy jan & selling feb . (as per calculator i only block 1091 as margin ) , how to execute this i am aware . on 19th jan only crude miniJAN will expire ,not the FEB ….. so how should i close or it will be done automatically to gain my 72 point profit and release the initial margin ? 3) what is perfect time-frame / time-gap before expiry to execute this strategy ? 3) There is nothing like a perfect time frame for this. 1) the mid month is going going cheaper than current month in many currency – equity futures …. so in this case can i simply short the expensive one even though is near one and long the cheap one (even though it is far) ? 2) my idea is to simply lock this “COST OF CARRY” as my profit and keep doing it again & again at the end of every month …. isn’t this a good strategy ? 3) once again i am aware how to enter an arbitrage , but how to exit it with profit ? you said i will get a chunk of this 72 points not the whole 72 points . theoretically i am buying something at 2383 and selling it at 2455 ( with a contract ) so i expect to get full 72 points . practically this will not happen , kindly explain why ? 4) what factors determine the size of spread i will earn & how ? 5) i am aware about entering an arbitrage and do not know how to exit it ? with respect to this case itself , i simply short feb and buy jan ( this is my entry with a margin of 1099) , now when jan contract expires what will happen ? PI will square-off the whole position or i have to do (FULL SQUARE-OFF) myself ? if PI just squares-off JAN contract and keeps FEB open then what happens ? 6) what are the risks involved in this type of strategy ? 3) If 72 is the number of points you are expected to get, then this full payoff of 72 is expected on the expiry day. So in the event you square off the position before this, then you will not get full pay off, you will only get a part of it. 5) Exit is simple – just reverse the positions and you are through :). Once you have reversed you will not have any open positions, so no question of Pi squaring it off on your behalf. i will hold this position till expiry ( by is it called arbitrage or hedge ? ) & will not square-off on my own . generally it would need me 4000 margin to trade 2 lots . but as i have this hedge position i only allocate 1000 margin . 1) now on expiry PI closes the position my query is will it close just the near month or the whole position ? 2) if it closes simply current month & i don’t have any extra margin on my account , what will it do for extra required margin ? 3) kindly explain ” execution risk ” ? 4) suppose the short month appreciates in price and long month depreciates ( well i take loss in this case , but once again when i entered this position both my buying & selling price are set …… so i should not have any concern about what happens to the script after the orders are filled ) …. kindly comment on this point of view ? The holding period does not guide the strategy name. For instance you can hold the arbitrage trade till expiry! 1) Just the near month contract will be closed and you will have to manually close the mid month contract. Please guide me on day-trading. 1.How do I select stocks for it? 2. What should be the look back period for finding S&R levels? 3. Should I stick to top gainers & losers? 4. Do midcap-50 stocks prove out to be better than nifty-50 stocks as they show more percentage movement? 5. What time frame would be better for me? I never scalp. I don’t know what’s wrong with my strategy, I trade equity using 5 min – 10 min charts with 21-7 period crossover system. I don’t use technical indicators, I only study price action, volume and candlestick patterns. I never trade before 10AM, if I do however I feel like gambling and pushing myself out of my comfort zone. Should I start using indicators like RSI, MACD and Directional Movement System? 5) My suggestion – try and hold the trades for longer period. Even if it means doing overnight trades. I have sold nifty call option 11000 june 2016 at the rate of 2 rs (150 qty or 2 lots)in MIS and it also executed. There is no seller in this call option, so it is still reflecting in my position and margin amt is also blocked. if MIS is selected position has be settled at the end of the day but it is still open. Well, if there are no buyers then the position will be forced to carry forward and your margins will be blocked till the position is squared off. Also, please do remember – its always dangerous to place intraday orders in contracts which do not have liquidity. This is also called ‘liquidity risk’. I really appreciate your and entire Zerodha team efforts …….. these VARSITY module is really helping us to understand share market ………..
For Next month ( feb month expiry attached in sreenshot ) open interest is shown in green with 400% (( which means open interest is getting increased ) …… please correct me I am wrong. Now If how I should check if open interest is on positive side ( stock price is expected to increase ) or on negative side ( stock market is expected to decrease ) , how to understand if I should go long or go short as I can see just increase or decrease in open interest ? The below highlighted with red box content repeat and table also misplace repeated. Please change the correct content. Thanks for highlighting this, will look into it. How Put Call Ratio is related to Nifty and how Nifty reacts with the increasing or decreasing of Put Call Ratio in the market hours and at the EOD chart, do we have any reading material on this in Varsity. And how it could help in interpreting the nifty trend whether it is bullish or bearish. Please advise. Thanks in advance. We do not have any material on Put Call ratio on Varsity yet, but will soon put up a chapter on this. Request you to kindly wait for a little longer. Thanks. Hi Karthik, The initiative of zerodha is just amazing and the knowledge you are spreading is a wonderful gesture. I would like to know more about currency contracts, fx spots and forwards, swaps, corporate actions etc. Is there any chance that you would go for the subjects in future?? Thank you for the above thorough content. was able to make some good profit today as a beginner in nifty. Ah, not sure, this appears a bit confusing – can you please share the context? It gives a general sense, will be writing about this in more detail in Module 6. Team Zerodha.. you are doing fantastic work. today i am able to make some good profit in option trading. thanks . special thanks to Karthik sir. Hi Karthik, can you please provide me a source or website where I can check put call ratio chart or data? Not sure of any reliable source Ali. When can we expect currency and risk management & trading psychology modules to be available? Cant really commit a timeline Shafeeq, but we will certainly put up the content as soon as we can. Thanks for your patience. For a beginner like me, this is really a great document. It gave me a good understanding on Future Trading (In fact all previous modules I red so far are good). I convey my sincere thanks to the author(s). Also I appreciate entire Zerodha team for providing a good trading platform. I have one doubt on Futures (This question applicable to Intraday trades in SPOT market as well). Since the future market is cash settled, does that mean there is no restriction in number of open interest at any point of time? To be more clear, Say there are only 1 lakh shares of a company available for (or held by) public. However, it looks like there could be more than 1 lakh open interest in Futures market as no one is expected to take delivery and all are squared off on expiry date. Is there no restriction in number of open interest? (Though sum of Long and short is zero). Which mean Bulls (or Bears) can manipulate the quantity to pull the price to their direction without any restriction? Apologies if my question is not making sense, May be I misunderstood something. Thanks Karthik. This information is sufficient. This is exactly why you need to look at EOD data 🙂 Real time OI information can be a bit misleading at times. Most of them provide based on EOD Technical Analysis basis….but some of them provide based on simple quantitative analysis as well. Yes it gets reset to zero on the day of expiry, but the zero OI is not displayed anywhere as it is implied. Hi Karthik , Managed to discover the number of nifty contracts bought and sold by FII on NSE website. I also concluded that the number of contracts dealt by FII on nifty futures is a very tiny percentage of the overall change in OI for nifty futures on daily basis. Could not understand why the impact of FII is considered so important by channels when their percentage impact is small ? FIIs play a huge role in spot market, you should consider that as well. There is a module option trading strategy.. is there any for futures trading ? In today’s derivative bhav copy there is net increase in stock futures open interest by 1.57 cr shares where as in participant data there is overall decrease in open interest of stock futures by 5499 contracts. Can you kindly explain how it’s possible as I am unabletounderstand. I’ve noticed similar conflicts in OI data, I’d suggest you stick to the bhav copy data. This is with respect to chapter 12.2 OI and volume interpretation. As mentioned above, when OI and prices increase more trades on long side, when OI and Price decrease it is long unwinding etc. Its just an empirical inference based on the fact that the price has increased along with increase in OI. Likewise with increase in OI and a decline with price. So a typical move from an OI perspective will be……As prices increase, OI increases then at some point (tops) prices become stagnant and may even start falling. At this inflection point, shouldnt OI show stagnation…..or maybe a little reduction…..Since the longs will be liquidating and fresh shorts may be getting added…..because along with fresh shorts, the long will also reduce…..then maybe after a few days, OI will again increase due to short buildup? I am just trying to determine how do we see the churning of OI…..Is there a way? This would be tricky, as the entire OI theory is empirical. When prices fall (assuming at tops) the OI should decrease — this would indicate unwinding of positions. If fresh shorts are added, then OI should indeed increase. Nice article. Can you explain in detail about Positiion Unwinding wrt Derivatives? I find it quite difficult to understand this particular topic. Anand – position unwinding is basically referred to when you close an exciting position. For example if market has a many long positions and participants start to close them, then its referred to as long unwinding. Like wise closing out short position is called short covering. Very informative website and tutorials. Enjoy learning from you although I’m not from the India continent. Thanks a lot for the efforts and keep up good works! Glad to know that Kelvin! How to calculate Rollover percentage? It would be very helpful if you share formula with real time example. Not sure if there is a formula as such, at least I’m not aware of this. 1) In the last table of Open Interest, you mentioned that if price and volume increase then it means trade is more on long side. But long & short sides are always equal so how can one side be more than other. 2) In case of futures, at the time of squaring off the position should we compare the price with spot price at that time or future price only. 2) You should ideally be comparing this to the profitability of your position. Amazing content. Been reading. I’m a new trader with two losses, but learning a lot. Thank you. Just a small error which i found – But is typed as buy. — this line — Clearly volumes and open interest are two different; ** buy** seemingly similar set of information. Thanks Govind, will make the change! Would like to know how to get LIVE Change in Open Interest for options in Zerodha PI platform? Or other than NSE site where can i get this? Thanks a lot Karthik! Much appreciated and also was able to place orders today. You guys are doing a great job!! What it mean in NSE site OI Spurts ?? It just refers to changes in OI. If we buy a script in ban period and sell it on the same day, will it cause penalty, As I am not creating new position? If I carry the position it is entitled for Penalty, what about Intraday? You cannot buy a script which is under the ban period! However nothing is mentioned in that link about Penalty. No penalty as the exchange will not allow you to initiate fresh position. You can only unwind the existing position but cant initiate new one! Yup, the penalty is around 5-8K per lot…not sure about the exact formula which is used to calculate this. Please clarify below doubt. How can change in open interest be negative before expiry in case of call and put options in Indian stock market? As per my understanding, all the options traded are European in nature, thus all the square-off is done only at the expiry. Negative change in open interest essentially means that some contracts were squared off thus reducing the number of open contracts in the market. Since we are trading in European options, how can change in open interest be negative before expiry? I have seen this behaviour for both ITM and OTM call\put options. Please correct my understanding. Change in OI alone is not negative, it has to be associated with the price change as well. Thanks for he revert sir. But my original query is still unanswered. How can change in OI be negative in between the month? Doesn’t that mean square-off of options which is not possible in case of European options? Change in OI can certainly be -ve when there are more contracts closed than being created. Thanks for the reply. So contracts closed means squared-off right? So is it possible that contracts can be squared-off before expiry date in case of European options? As per my understanding, European options can be squared-off only on the expiry date. Closed can mean squared off or let to expire. Yes, it is possible to square off anytime before expiry. However, the settlement will happen only upon expiry. So negative change in OI in case of European options is possible? Plz clarify it . In nse site OI spurts means change of OI. Which OI change ??? Option OI or Future OI or any specific call or put OI Or all together ??? You can select to check the change in OI for each instrument. Why dont you come up with a module on intraday day trading strategies. But still i am in confusion . OI Spurt refers change in OI o.k. My question is which ones OI change ?? In that row in NSE site there is a colum of Options (Premium). I am asking in that particular options OI change ?? OI refers to the position wise change and not really premiums. 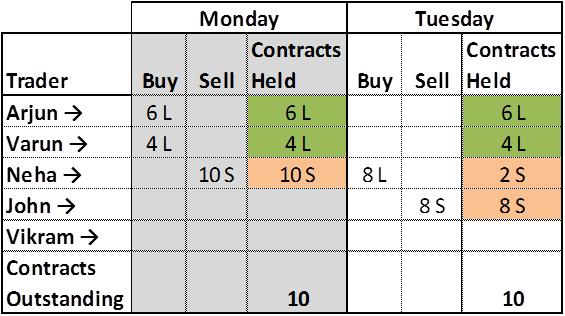 So for each Futures/option contract there will be an OI change on a daily basis. Hi.if a security is in ban what will be the effect on price in it.eg ceat.its in ban and the price is only falling.wen can it go up. There is no direct relation to the security getting banned and prices. In the NSE OI Spurts data page, OI of a particular stock falls rapidly at 3:30 PM. Why is that so? For example on Aug 23rd, OI % Change for JUBLFOOD is at 36.09% at 3:29 PM and at 3:30PM it is at 5.99%. For HDFC at 3:29PM is 17.13% and at 3:30 it is 0.49%. Can this happen?If yes, what can be explained. Or the data is wrong in NSE. I am a bit confused. I know learning myself about trading would make me successful trader instead of blindly following expert advises. I am not expert in this domain for now so for the time being Could you suggest some websites which could be followed for stocks recommendation(and know about stocks to buy/sell,target value,stoploss,time duration to hold position) ??????? You got to be your own analyst…only then you can trade the market. i got lill bit confused with the Details Shared with you here on Varsity. Plz Clear my Doubts Definitely there is some Issue with Typing related error but i m not able to figure out which one is Correct..
as in PDF module you will find the different Interpretation for the Volumes mentioned in the Screen shot. Aurn….thanks for pointing this out, I guess this is a typo error in the PDF. Consider the online version as the accurate one. 1 long + 1 short trade = 1 OI. So the OI tells you how many longs and how many shorts :). To infer bullish/bearish bias you need to associate the OI number with prices. Actually i am trying to infer the roll overs from near to mid or far month contracts. Is it possible to get the individual roll overs (long and short) from contract month to another. Maybe, but I’m not sure of a reliable source which can provide you this information. Thanks Karthik. your knowledge sharing is beyond thanks. Praveen – 1 long + 1 short = 1 OI. Likewise 100000 OI means, 1000000 long and short. Ok. How to identify the direction (long/short) the big players are betting? You need to associate the price movements along with the OI/Volumes information and then interpret the results. You can, but not at the same moment. Hi Nithin, What do we need to infer when delivery volume or delivery % is decreased compared to yesterday along with increase in price and decrease in futures OI. Thanks. what percentage of delivery based buying is considered high and what is low?also, when OI decreases with an increase in price it is said that this could be when the institutions are taking delivery of the stock and hence price go up which leads to speculators unwinding. how can one look at the charts and look up OI data to come up with a trade? where do the short and long build up of data that we hear published? That was informative.thanks karthik.but, can u tell us where the EOD data of long and short build up is published? It should be available contract wise on NSE, check for the bhav copy. What is the Minimum OI change will affect stock movement..I mean in percentage or OI. Not really sure if there is any reliable number here. I didnot get this. So between these 5 traders OI finally became 10. But in the over all market wouldnot the number of contracts remain same. Every trade will create buy or sell.So where will the contract vanish. The existence of the contracts depends on how many people hold then (either long or short). So in the case explained, there were totally 10 that were created…if you go in to buy a new contract (and it should match with a seller wanting to sell the same to you) then a new contract opens up. going through OI analysis on money control i found only PUTS listed under “increase in OI & increase in price” when , this is where the sentiment is long.shouldn’t there be CALLS too? similarly only CALLS listed under”increase in OI & decrease in price” when, the sentiment here is bearish. shouldn’t there be PUTS too? i know when you buy CALL or PUT it’s long and when you sell CALL or PUT it’s short. am i missing something? Can you please recheck the filter settings on MC once? there are no filters available, when u click on a particular script you get the data as it is under the heads such as”increase in oi & increase in price ” etc. do go through the link i have attached and let us know how you read them. thanks karthik. Hi in nse market pulse September 2016 in page 7 there is participant wise oi for future index long and future index short. The data is mentioned in percentage. How to find numerical data for each index (nifty, bank nifty etc. )and on daily basis. The document is monthly publish. Check the scrip wise, end of day data on Pi. Hi I checked for the data and found it has long unwinding short covering etc. I would like to know only the long or short open interest for each script at the Eod. Can you please let me know how to find the data. Where to find the requested data in nse website. You cannot differentiate between long and short OI. You will need to associate price with it and make an inference. Thanks for reply. But in market pulse report nse has differentiated between long and short oi. Can you please look into pulse report . You can rollover by squaring off the current contract and taking a similar position in the next month’s contract. Karthik. Arvind ltd is at a life time high of 418. when one looks at the data for today th OI has shrunk by 23% and the price has increased by 2.5%.this means there is short covering. the deliverable to traded quantity is 10%. which means FII’s haven’t brought huge quantities for the price to shoot up and hence speculators r unwinding. my question is, do you think speculators would have shorted merely because the price is at an all time high? if so, should there have been a build up of shorts earlier? From the data points you give me, I get a sense this is bull trap…and yes, many traders short hoping for a quick reversal in prices when stocks hit all time/52 week high. Hello Sir, Thanks for your neat explanation. I have few queries. I am pretty new to Futures. I would like to understand; what should I do to close the futures trade? Am I obliged to buy the lot at agreed price by Thursday of the month? As you said futures happen through cash settlement should we really buy the shares or settle only the cash difference which i hope is already done through M2M? Will our margins be erased if we do not buy those shares? Can you explain please..
Karthik, if a chart looks bullish with OI and price increase and the deliverable to traded quantity around 60%, can one with all the data above trade on the long side with absolute conviction? is there an other dimension you would advice? i am trying to be comprehensive and follow a trading strategy through the above.do advice. thanks. I’d give the chart more weight age and build my position based on it. OI and deliverable qty is good to know, but I’d not depend on it entirely. ok, but referring to your answer to Madhu above one would know it’s a bull trap only because the traded quantity in the above case of arvind ltd was 10%. the chart would have looked positive by itself. so knowing the data points of OI, price and deliverable% would help. isn’t it? Well, if you ask a ‘OI purist’, he would consider only the futures price and OI data. The % deliverable is good to know but I would not rely too much on it. How to get past few days data for Open interest and Change in open interest for an underlying? Also, would that be different from the relevant data for different contracts for same underlying? You can get the daily EOD OI data from the Bhav copy report from NSE. Yes, technically it should be different for each contract of the same underlying. Thank You so much. Help me a bit more with this. I have observed that open interest falls tremendously during the last week of expiry since the positions are getting closed . So, how can it indicate anything meaningful as we know when OI falls its either short covering or long unwinding depending upon price movements. Correct me if I am wrong. Change in OI is used to establish possible top/bottom or trend confirmation. Change in OI for the underlying rather than contract wise data should be used for such analysis. What do you think? Kumar, OI on a stand alone basis does not convey much. It has to associated with the underlying price movement to make some sense of it. Yes, last week to expiry the OI data tends to get skewed….you got to match this with the next month OI build up to understand how things are shaping. Also how to know the exposure margin for intra day nifty fut, as the margin calculator give the span and exposure of the normal trade. Its 49K in both the places. Can you please recheck? from where can i calculate the exposure margin for the MIS product type? For NRML product type Zerodha margin calculator gives the value but what about MIS? 1. How increase in price and increase in OI tells you there are more longs. For each long there is someone shorting it as well. To me change in OI is just an addition / removal of contracts which has both sides. My whole confusion is how can i be sure whether longs are more than shorts when they are equal in number. 2. Is there any indicator or information that tells me a future had more buyers than sellers or vice versa who could not complete the transaction. 3. I am eagerly looking for trading strategy module. When is it coming up? Any other reliable study material for trading strategies. 1) As I’ve stated earlier, OI analysis is empirical. On its own merit it conveys nothing. One has to associate the price movement and derive some meaning. 3) Hopefully, soon :). I’m not sure of any reliable source for this. i have an open order, now lets say i place a limit order to square off the open position. the order has been placed(not executed). now due to some problem like network connection or current failure i am disconnected form kite or pi. So will that order still get executed when the price is triggered?? Once the order is placed, it will lay dormant with the exchange till the price matches. You will have to modify the order if you wish to cancel it. Check section 12.4 – http://zerodha.com/varsity/chapter/crude-oil-part-3-the-crude-oil-contract/ this should give you an idea of how this can be done. Increase in price should reflect across all contracts, else you have an arbitrage opportunity. I’m not sure Amit, can you point to a recent example? hi KARTHIK when commodity expire in near and open interest in decreasing in goldm ? wht will be in gold to goldmini? Same. As a derivative contract approaches expiry, its natural to expect a decline in OI. but when both contract expiry is near normally diference of gold and gold mini difference will be spread ya sink what cause? There should not be any difference as its the same underlying. If there is a difference, then the same will not last long as arbitragers would set up trades to exploit it. 4 Jan open price:- 166.75. Thinking that it was some mistake on part of nseindia website, I refreshed the webpage to find the same figures. I scanned all the possibilities to find what happened to the stock in top 50 losers, top volume gainers, 52 week low, low price band hitters, but couldn’t find this stock in any of the headings.Then upon clicking OI spurt tab, Voilaaa….. it was on top of the list.After that I went through the OI segment of but couldn’t understand what happened with this particular stock. Change in open Interest:-Whopping 883.50% Jump (4,61,10,900). Please explain what all went through the night b/w 3rd and 4th Jan that led to sudden fall of this stock. What would have happened to the traders who were holding this stock or the futures ? Are they on the street with a begging bowl ?Please present a detailed analysis of this real life phenomenon especially in light of OI. PS:- previous to 4 Jan , the average volumes trading was in thousands (50-70K) and also the bid-ask spread was also large (50paise to about 100paise)but today the volumes trading were in lakhs and .bid ask spread was 5-15 paise. hi KARTHIK can you tell me what cause difference between gold and gold mini. some time 100 rs sometime 300 ? Simple ‘demand – supply’ disruption can lead to this. I just want to ask as OI data is for future & options contracts, is it relevant to study it for taking trading decision in cash segment. As I know prices of any stock in spot/cash market fluctuates based on demand & supply of shares and not its derivative contracts. I also know that derivative price are dependent on spot/cash mkt prices of underlying security and not viveversa. So Why we should look for OI data before trading in cash segment. No, it does not make sense to look at OI info for making investing decisions. OI data is short term in nature, and bears no influence on long term performance of a stock. 1) when call IO decrease but call volume increase or vice versa..what its interpretation??? 2) there is any way to figure it out whether call option writing or call option buying if call OI increased???? i read article in which its mentioned that option writing on some specific strike price…how they analysised ???? The table in the OI chapter suggests the possible interpretation for change in price, volume, and OI. When OI increasese, both buying and selling increases. Can the change in OI be greater than the volume of traded options on that day? Volume is the number of contracts traded for the day. OI is a carry forward number and keeps changing till the expiry. I was referring to the “change in OI” for a day. Can that be greater than the traded volume at any point of the day. And I’m assuming the change in OI is only for the day and not carried forward.Am I correct, Sir? Yes, change in OI is only for the day. Imagine a situation where there were 2 trades for a day, but the order size was large enough, creating a huge change in OI. If the order size is large enough that would be reflected in the volume as well, isn’t it? If the order gets executed, then it will. Sorry Sir, but it’s still unclear how the change in open interest be greater than the volume as Volume comes first and then the change in Open Interest. Sir an elaborated explanation would do a lot better. I have seen the change in Nifty futures OI be greater than the Volume a few days back but couldn’t digest as how. You may have a point here, Akash. Apologies for misleading you. NSE’s intraday OI data is not too accurate, do read this – https://tradingqna.com/t/is-the-live-open-interest-oi-data-being-provided-by-exchanges-correct/7208 . You need to think about these two as independent variables. Volume represents the total number of shares/contracts traded for the day. Today’s volume will not impact tomorrow’s volume. They are unrelated. However, OI comes to life moment a contract is introduced and continues to exist till the contract expires. Its a cumulative number, meaning today;s OI is carried forward to tomorrow. Given this, OI can be lesser than or equal to volume. what does negative volume percentage means ? It means the volume is lower than the previous reference point. How to interpret the OI data? I mean Where can I get the data of OI ? I have recently opened Zerodha a/c . Can we add seperate window for OI. As I am a positional trader this is entirely a new topic for me . I want to start trading in futures and options. I want to know how to begin analysing OI and volumes. How Oi affects futures and options? OI data is available on a EOD basis on PI and even NSE website. I have explained OI in good detail in this chapter, I’d suggest you give it a read. Exchanges do not create unlimited future contracts. There is a certain formula based on which contracts are created. All the details worth knowing are discussed in this module. How can we interprete any trend reversal based on current, mid, far months contract prices? Its hard to identify trend reversals, but maybe you can identify few arbitrage opportunities. 1. Suppose i have to go long/short & i want to enter a contract, what will happen when i will enter a contract ,will the new contract generated or i will get the transfered contract(position of another person who has sqaredoff his position)? I contact customer care they told something about open interest , I could not understand however I know what open interest is, but I don’t know how due to this order can be cancelled. This is my first time experience, I contacted my one friend who is client of another broker and he was able to place the order , how is this possible? Order rejection was at broker level? Rohit, exchanges impose open interest restrictions at trading member level. A trading member cannot have more than 15% of the total OI. Zerodha is probably the only broker hitting this 15% OI limit on weekly bank nifty positions. This is probably because, clients recklessly buy OTM options, hoping there would be a sudden movement on expiry day….you can think of this as a lottery instinct…and hence we are hitting the OI limit consistently on weekly bank nifty contracts. One of the ways to prevent this is by restricting clients to trade OTM strikes. What you experienced was the same. Whats the different open interest spurt change and equity derivatives oi change. Ah, you will have to check with NSE for this. at same time in OI Spurts page % of oi 43% . I am still confusing ???? on what circumstances volume will be lesser than the “change in open interest” ? Guess, someone had asked the same query earlier, there was a discussion around this. Request you to look through all the comments. Thanks. Sir,How can we say if OI increases More trades on long side as for increase in OI there is equal no. of long and short? OI on its own does not convey much information, hence we need to associate OI data with price information. This is regarding arbitrage trade in futures market. I understand from today’s session that screener (smallcase ) provides arbitrage opportunities on the basis of end of day. Request you to suggest right time to enter positions. Would entering after market order be fine or you suggest some other timeline. Also is there a free paper trading platform for futures and options. I see that in moneybhai you can only paper trade in stocks. If you are required to short cash, then you are better off trading cash and carry on an intraday basis. Thank You Karthik. Request to confirm my understanding for below two scenarios. Also request to provide if there will be any other risks in addition to the below risks when we enter into Arbitrage trade. c. Close the trade on the same day assuming price difference in cash and future market will decrease. Risk 1 : Price difference increases instead of decreasing by EOD. Risk 2 : Future price decreases exhausting margins before closing both the positions. c. Close the trade on the same day if price difference in cash and future market will decrease. If the price difference does not decrease hold it till expiry assuming the price difference decreases by expiry. Risk 1 : Future price decreases exhausting margins before closing both the positions. Please ignore risk in the above scenario 2, as i think that would not be a risk. However as already mentioned, please do highlight if there are any other risks for above scenarios. Hi. Can I see the graph of OI for a Futures Contract in Pi / Kite. I could not find this, and if it is not available, I think it would be a really cool and useful feature. Since, the OI can be seen at any time, it should be relatively easy to just store the values and show a time graph. I’d agree. Will get pass the feedback to my tech colleagues. Is the market maker or the exchange responsible for change in OI ? No, OI is a direct function of the trader’s participation in the market. So every future contract comes into existence when someone short sells one contract and someone else buys that contract ? True…a contract originates when a trade matches on the exchange. Is it possible that once I short sell the contract and at lower level when I want to buy the contract, but there are no seller in the Market? Hedging option with future… Does this work? Lets say i see a strong bull signal (Intra day trading). I bought 1 lot of bank nifty. But as soon as i bought market starts moving down, so i bought 2 lot of ATM Put. If market reach back to my original price, i will exit PUT, else, i will exit future. Do remember, any sort of hedging is an expense. It works well as long as your timing is good. Today I started digging deep into OI and I found that OI in options chain seems to act perfectly as support and resistance. I checked for index and stocks. It exactly shows the exact reversal. From monday I am planning to use Nifty options OI to trade nifty futures. Any suggestions or comments about this startegy? OK. I will test this on Monday. I have been study future trading. I want to know suppose I buy one lot of any particular stock say TCS. And I don’t sell till the expiry. What will be the consequences. Exchange will sell my one lot of TCS and credit my account with whatever was the price at the date of expiry or all shares will be credited to my Demat Account?? Suppose TCS price is Rs.2,500 in cash market and Rs.,2300 in Future, then can I sell in cash market and buy in Future market and take the delivery? I will be benefiting Rs.200 per share. Is it possible? Yes, but the problem is that you cannot carry forward the short position in cash. Short positions in cash have to be covered on an intraday basis. — Since all calls and puts are derivatives of the underlying asset, then why do experts say that there is high amount of call writing or put writing at particular strike and it won’t allow the underlying asset to cross that. Suppose a stock is trading at 205. And there is high amount of call writing at 210 and put writing at 200. So the stock won’t find it easy to cross 210 or 200. How can a derivative dictate the underlying asset? Nobody controls anything in the market. When they say ‘they will not allow’, then it means that they don’t know what they are talking about. If there is a high amount of call writing, it only means just that. The writing could be done by 1 participant with a large appetite for risk or by many who believe that the stock may not go up. First of all thank you very much for the way you explained everything..
My queries are as below,pls reply. What is your opinion, is there anything I am missing here? 2. Is there any way in PI or anywhere where I can backrest more than 120days. Good luck for finding a great strategy. 2) I guess so. Please contact our support for this. Thanks for your reply.. Also pls guide how can I plot in chart Nifty 50 volume(accumulated volume of 50 stock). Is there any way to put stop-loss and execute buy sell of nifty option from Nifty 50 chart. Nifty 50, the index, is not traded on the exchange. You can trade the futures though. The volumes of Nifty 50 represents the collective volume of all the Nifty 50 stock. I can chart Nifty 50 in kite and pi, but volume(traded volume of 50 stock of Nifty50) is missing. Can I get that Nifty50 volume at bottom of the chart like Nifty Future. I know it seems silly… Pls reply. It is available on Pi. The number of long position should match the number of shorts. It’s best to get this information from NSE on an EOD basis. Is there any tool available ( or can we do it through Pi\ZT) to collect open interest for a particular time frame to analyze the trend ? There is an option in Nest Trader to collect VWAP statistics for the different timeframe, but the problem is everytime we need to manually collect this data. why is vol always less than change in OI in options? Not true as these not really related. Change the name Ajay to Arjun in table in subparagraph 12.2 OI and vol. interpretation. It is adding more confusion in understanding OI and volume. Sure, let me look through it. Thanks for pointing. open interest change in -15% it means what happen in the market? It means the number of open positions reduced by 15% since yesterday. If % change in open interest is increasing does it means that trend is positive? can we enter the trade ? Traders generally associate the price with OI information to make sense of the direction. OI on its own may not help much! I’d suggest you stick to the spot price, Dinesh. Today saw this msg on Kite. I traded on Nifty twice (1 lot) after reading your material & made small money. I want to know if Bank Nifty (11th Sep 17) is trading at a discount (lower than spot around Rs 20.75) but closed higher than the previous day (up by 1.14%) & OI addition is abnormally high (25%) on that day, what do you conclude. HDFC Bank gained on this day in a big way(1.56%) but HDFC Bank Futures is trading at a discount of Rs 12/- but OI addition is 3.96%. PSU Banks & ICICI Bank were down. Frankly, its very hard to comment on such situations, Vishwanathan. To make any sort of conclusions, one has to backtest for these scenarios and check the historical behavior and further looks for consistency in patterns. If supply is higher than demand in futures, then futures would trade at a discount. But the confusing part is OI shooting up & price going up in spot & futures from previous day close. These are 3 different (and independent) moving parts…so it is quite possible. Yes, open any chart > click on display > select the Volume Candle option from the drop-down. Nothing available for now, Kabilan. just completed your module on futures trading explanation was really awesome. material u wrote was great as well. I had a question how can a futures trader evaluate whether futures script is liquid to trade personally I see the how smooth the price action on the chart is.what u do to evaluate whether the futures script is having moderate to good liquidity to take a trade so there is not much slippage even if we get stopped out .it has happened to me a couple of time when risk on the trade was 10000rs but lost 12500or so on the trade due to slippage. The best assessment of liquidity is the difference between the bid and offer. The smaller the difference, the higher the liquidity. If the difference is high, then less liquidity and best to avoid placing a market order in such contracts. one more question what should be the standard no. of open interest and volume for the futures script to be considered liquid? I’d suggest you stick to accessing the bid-ask spread, the is a good indicator of liquidity. IN FUTURE WHO DECIDES MARGIN. WHETHER IT IS DECIDED BY NSE AS WAS TOLD TO ME . I OBSERVED MARGIN AND PROFIT/LOSS IS BEING DEDUCTED SIMLTANEOUSLY. ALSO I OBSERVED OPEN PRICE IS CHANGING DAILY. PL LET ME KNOW ABOUT THIS. I have already gone thru your Margin M2M topic and the example given by u is very easy to understand. I have exactly the same table made to know daily margin shortfall due to M2M. But littlebit getting difficult to understand. I feel I have to take up the matter with my Broker Company as how they are calculating Margin pay in. Any way thanks for your guidance. Again I may come with some qyerry in this regard. Pl help. Sure, please do feel free to ask! I was trying to analyse FII statistics report published by NSE. I can’t understand if the report really can be true. I am putting here real data for “Index Futures” for 16 Oct’17 which baffled me for couple of days, finally forcing me to raise it here. Buy Contracts 47451. Sell Contracts 15748. Also I calculated the “Change in OI” (contracts), using previous day’s data. So Net OI addition was 27925. I did all math, but just can’t understand, how above numbers can be possible. It won’t matter if we say there are so many FIIs buying selling simultaneously. NO, that’s not a proper reasoning. OI addition need to come from an unclosed Buy or Sell contract. So maximum “change in OI” can be Buy Contracts + Sell Contracts (assuming no intra day sq off btw Buy & Sell) and Minimum “Change in OI” can be difference btw Buy & Sell (assuming complete intra day sq off for the Buy or Sell (which ever has lower volume)). As per this for 16 Oct’17, minimum OI change should be 31703 contracts & it can’t be 27925. Infact I found lots of such days. Could you please explain elaborately. I’d suggest you avoid building any strategies which rely on OI information. Karthik, I have read this article before also, but it don’t solve my puzzle. The article gives a reasoning for why OI can be wrong during intraday trading hours (due to settlement issue), but do not raise question on EOD reports. I am precisely talking about EOD report (FII statistics). Now if you say that you question even EOD reports also (as you stated above), then there is no sancticy for any EOD report or any other report by NSE. Else, how can you be sure of any other report?? I doubt if this is the case as there would be cases filed against NSE for “misrepresentation of information”. The catch here is something else & I really want to know what is that. Could I request you discuss this with your knowledgeable peers/superiors to find a relevant reasoning. This clarity would be of big help to me as I doing some analysis for which this information would be critical. From my experience, all reports from NSE are accurate, except for the intraday OI information. Let me check, I’ll get back as soon as I can. Hi Karthik, Were you able to find out. Any update please? could you write about future trading strategies. like you have a whole module of option strategies. just one chapter. Module 10 will be on trading strategies, Abhishek. Guess its gonna have a mix of all. I just wanted to know that the Open Interest that is shown in Zerodha Terminal is different from that on NSE website (https://nseindia.com/live_market/dynaContent/live_watch/option_chain/optionKeys.jsp?symbolCode=-10006&symbol=NIFTY&symbol=NIFTY&instrument=-&date=-&segmentLink=17&symbolCount=2&segmentLink=17) though the volume shown matches with nse website. I justed wanted to know which Open Interest should be referred to, the one on the NSE website or zerodha NEST Terminal, and why there is discrepancy in the numbers. Thank you so much sir. Indeed great explanation for newbies. Please help me to understand on following. 2) What will happen if I bought a futures contract for current month during first week of the month, and I wanted to square it off (sell it) after 3 days but there is no one willing to buy it? 2) You can square it off anytime you want, not necessary that you hold it to expiry. Does that mean we can always square off our position in futures before expiry irrespective of any situation? Does that mean we can always square off our position in futures before expiry irrespective of any situation? I understand that we can square off before expiry but what if there is no one available to square off before expiry. As per the contract it is always possible to square off on expiry. But there is no guarantee about square off before expiry. Is my understanding correct? my understanding on square off in futures – let’s say i bought a futures contract, if I want to square off my position before expiry I need to sell it (transfer of risk to someone who is ready to buy it) what if there is no one to buy it before expiry? You can square off the position anytime you wish, however, as you rightly pointed out, if there is no liquidity, then you can not square off….btw, your understanding is correct. I am new to future trading. It will be a great help if you could answer following. If a stock in down trend and price are falling slowly but surely & volumes (no. of contract traded) declining heavily but open interest is rising marginally than what the trend suggest ? Does it suggest that bottom has formed and prices are likely to go up or any other trend ? Also suggest if any other precaution to be taken. I would be inclined to say yes, had it not been to rising OI. Rising OI suggests the bears are adding more positions – please note all OI related inferences are just empirical. Take this with a pinch of salt. Thanks for your answer. Yesterday on 14/11/2017 evening I analysed following data and decided to sell ‘NCC’ Today on 14/11/2017. However ‘NCC’ future rose to 5.68% from the close of 13/11/2017. Can you please let me know where I was wrong ? I was convinced that NCC is going to fall but it was other way around. Your detail answer will help me a lot. Reena, all your analysis about volume, OI, PCR, price action etc works alright in the absence of fundamental news. When there is a fundamental news, which is the case here, you need to look at only the Fundamentals. You should be in a position to analyze the fundamentals and make sense of the numbers. Remember in situations like these – fundamentals supersedes technicals and everything else. If there are 100 Open Interest’s in an Equity PE Options( OTM). If I am selling one that Options(OTM) and volume being trade is just 5-6 per day. What if I keep my position till last day(30th Nov,Thursday). If there is no voulmes being traded, will i still get to keep my premium or not? Since OTM diverges to 0. Can u elaborate what will happen on the last day. If the OTM continues to be an OTM even on the expiry day, then the option will be worthless and close at 0. Can we trade options from smallcase’s zerodha login? No, you cannot trade options via smallcase. Yes, if you hold to expiry then you will get settled automatically by the exchanges. I have been following your series on this zerodha varsity portal, and I must say you are phenomenal in explaining concepts with apt illustrations and anecdotes. You are n inspiration, keep inspiring!! sir, if i hold options of a security and the next day it comes under ban, then will i be able to exit & book my profits in ban or i have to wait for the ban to be lifted ? how to handle that situation ? You can only square off the position, Vicky. Does 400 contract means 400 lots of particular future ? Pleae clear me.. Yes, 1 contract = 1 lot. You have not answered why change in spot price is different than future price ? Dear sir,I am askimg why CHANGE in spot price is different then CHANGE in future price ? Because futures price is dependent on Spot price and under normal circumstances, futures is always higher than spot. price vs volume vs open interest …. Pls explain it in triangle realisionship… Every possibility… As early as possible..
Everything is explained in this chapter itself. Please look at the table. sorry Karthik sir but first time i don’t like these cheerleaders in cricket !! sir my question is that Nifty 10500 strike has open interest = 5641275 what does this mean? It means there are 5641275 open Nifty positions in the market or 5641275/75 = 75,217 contracts. 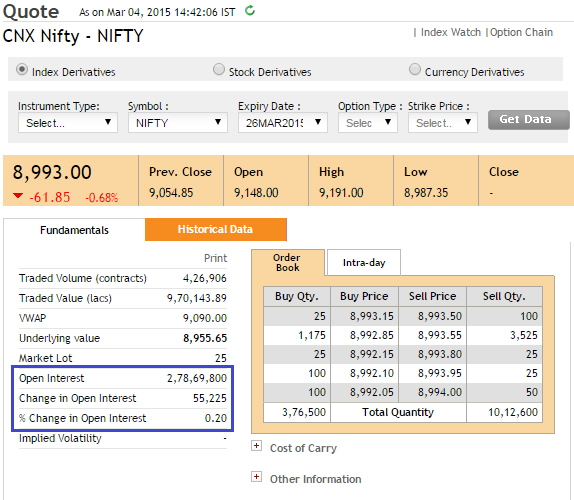 120PE Change in OI is 0 but 3 Contracts were traded – would those been intraday positions ? Yes, as per bhavcopy there is no change in OI. Is there any possibility to view intraday OI data…an OI chart for scripts/contracts either in kites / PI? I have few doubts with regard to OI, will go one by one. If change in OI is positive(today’s OI – Yesterday’s OI) then volume should be at least equal to count of change in OI plus it could be even more than that. If yes but alot of time I have seen less volume than change in OI(when change in OI is positive). Are you comparing the EOD OI? Because intraday OI is not too reliable. How would intraday OI make difference? sir in kite zerodha how we add open interest to the future cotracts???? Not possible for now I guess. It would really great if you add an article based on the difference between Futures and options. Which difference are you referring to, Sayan? Do you think entering a trade which has Increase Open Interest & Increase in Price (weekly basis) ‘could potentially’ be a profitable trade? Hi, can I know which website can I refer to get breakup of OI in Futures. or can I know all the break of OI for Future Stock in PI. The breakup of OI as in you’d like to know the number of buys and sells? This will be equal, remember for every buy there has to be a sell, and that will create 1 OI position. If I’m hedging my portfolio by going short on nifty futures and market move upwards then I’ll be losing on opportunity cost (my profit is capped). If yes then can it be avoided? Yes, the only loss when you hedge is the opportunity loss. Hi Karthik,Kindly help me to resolve fallowing doubt..
2.HOW TO CHECK BID&OFFER DIFFERENCE IS BUILDING UP? 2) If you want the regular bid and ask, then you can invoke this using the regular market watch. Is technical analysis and fundamental analysis are less important in futures? No, both are very important. When particular shares are in ban period, it is in futures or option or both. And if it is in option only then it is for particular price or at any price new order can’t be placed ? All derivative contracts get banned. How to add open interest line in chart showing the effect increase and decrease in open interest like OBV does with volume? Sarthak, both Kite and Pi don’t have an OI indicator. As I have mentioned earlier, I am a newbie in stock market dealings . At the age of 65, after retiring from a small scale industry , I contacted and got registered at Zerodha. I feel quite put back to raise my doubts. After making continuous LOSS for the last 2-3 months of trading, I got the guts to put forward my DOUBTS. When I click on market watch, some important data is opened. BID , OFFER columns Bid volume & offer volume Out of this which is Buy volume , Sell volume ? Total traded volume is also given . For selecting trading option Which volume I have to consider ? When I open NIFTO 50 option chain showing CALL & PUT options , what are the helpful data I can collect from it to short list my INTRADAY / SWING trading stocks ? Please clear my above doubts. I am REALLY SORRY if my above doubts are found SILLY. Kindly answer my doubts. Sir, firstly welcome to Zerodha! This forum is meant to ask questions and learn from each other, so please don’t hesitate to ask questions. Here I could not afford a trade like this . Is it because that I have not understand the trading method properly? Where & how I went wrong? You should not select the option strike based on the Rupee value it is trading at. The trade should be backed by reasoning. I’d suggest you avoid trading till you get comfortable with the logic. Does Open Interest affects cash stock? Sir, I have an question about open interest in option market. Today at 18th January Nifty underlying is at 10880.
my question is, what is the right option for bullish trend (a) whether to buy call option or (b) to sell put option. what generally people do. Always, option buying will be a better deal – this is assuming you are very sure about the directional movement of the stock. Is there a metric that shows the number of parties involved on the long or short side? Is there a metric which indicates the number of parties that are involved on either side for each strike price in options? No, there are no metrics as such. Sir, how to know whether shorts are covering or shorts are building up? I have heard, especially on expiry (thursday for bank nifty) when shorts gets covered price goes up or vice versa. But i dont know how to find such data. Please tell me where i can get data regarding shorts covered or build up..! Is it available on kite? These are empirical data, Pratik. Does not get reported as such. Ok, But how i’ll get knowledge of same? Like I said, this is empirical, you will have to observe and draw conclusions. how can we calculate net to net position of a future contract like there are long to unwind or shot will cover remain by the end of the series …?????? Hard to calculate this, comes mainly from experience. However, indicators such as RSI (overbought/over sold) gives us a hint of such likely activity. I see that there are 211 company which are trading in futures. Can u plz tell when the NSE update its list…?? I mean yearly or half yearly? They run a quarterly review on this and update the list. Sir I have one quarry….as m new in derivatives so just wanted to know few thing….1) Most of the time we see negative sign (-) / minus sign (-) in option chain specifically in OI Column….can u please tell what does it mean…? 2) Another thing I want to know….are there any limit of contracts that can be traded against each strike price…? I mean how many contracts can be traded against each strike price..? Is thr any limit..? What is meant by call/put writing and call/put unwinding. Shorting an option is also called writing an option. I have recently opened an account with Zerodha with an intention of trading, i have been transacting in equity market for quite some time,i am planning to start trading in derivatives hence i have few doubts can you please clarify?? 1.Can i trade in Futures by referring to spot market charts or should i refer to future contract charts to take a decision for trading future contract?? 2.Suppose if i have to look for future contract charts being a position trader what is the chart period i have to look for?? Eg: Should i consider 14 periods for RSI or less than that. 4.Which contract to trade for should i consider the near month,mid month or the far month? ?what would you suggest for a beginner like me?? 1) Yes, you can. In fact, this is the right approach to trade futures. 4) Near month has maximum liquidity, so I’d advise near month. Does OI give a clear idea of short interest of F&O? Not really, its only empirical. Unable to open the file “read this”. It says under maintenance. Can I access it in some other way sir??? The hyperlink has been updated. Can you check now? Where can I get real time data on open interest for Intraday trading? I searched both kite and Pi but could not find it. Please help. can i buy 1 lot of nifty futures in preopen session??? How does one find out stocks where there is heavy call writing?? You have to look the Open interest on an EOD basis to evaluate this. If both OI and price has increased, then it suggests that the price is likely to go higher over the next few trading sessions. Please note, this is just empirical, there are no guarantees in the markets. What is meant by Short/Long Covering in Futur/option market and why if OI decrease the price will Increase/decrease and visaversa, on what condition it will happen. Kindly explain. Is there any website that tells about the live market Change in OI / Chage In Volume / Chage in Prise in one screen of all F&O stocks. Its explained in this chapter, Manjunath. Varsity is absolutely amazing work by Zerodha. But I want this work should ceaseless.Zerodha community should update Varsity portal on regular basis.So that Zerodha clients get benefited by some new knowledge everyday. Sougata, the comments are updated everyday plus new chapter is updated once in 10 days. So it is quite active. 3) I also read that sebi wants to limit retail traders from derivative market. What are the rules who will be eligible? 3) That has been their intention for a while, nothing has changed yet. Sir ,once a futures contracts comes into market, that is, someone sells it and someone buys it, then until the expiry the contract cannot vanish from the market, right? I mean both the seller and the buyer can transfer their risks but until the expiry the contract will exist in the market. Am I right ? Yes, the contract will continue to exist in the market till expiry. Only the ownership of these contracts changes hands. I’m not sure where this is available graphically, but NSE publishes the change in OI on a contract to contract basis. Thank You Zreodha. I gain something. Karthik ji first of all I am very thankful for this world class material for stock market. Also recently SEBI has announced that derivative market can be kept open at the discretion of stock exchange till 11.55 pm. My question is how derivatives can be traded while market is closed. 2) Well, derivative can continue to trade but will get adjusted when the normal spot opens up. sorry sir for repeatative questions but i have doubt as follows. Q2- Means you are saying that there won’t be any movement in premiun after 3.30 pm. as spot market is close but the premium may change due to other option greeks. 1. How much minimum capital do you think is required to start trading futures? This I am talking positional trades and not intraday. 2. I am sure you must have open positions in your Zerodha account. Since we don’t have a GTC/GTD feature in Kite or Pi, how is it that you set your stop losses for your open positions? Do you log in every morning and set your SLs or is there a workaround to this? 3. And why doesn’t Zerodha offer any GTC/GTD feature while many other brokers are? Imagine if you are positional short term trader and you have 10 open positions. You must log in everyday to set SLs for all your open positions? That’s one huge shortcoming and not to mention pretty tedious for a trader. I know NSE doesn’t allow this but then many brokers are providing automated workarounds for this. 4. Lastly, is it possible (with Zerodha) to get continuous chart data (let’s say 6 months) of any future contract, without having to look at it’s respective underlying? 1) The minimum margin is about 65K for Nifty futures. Stock futures varies between 60K – 1.5L. Apart from the margins, its good to have some buffer capital to accommodate for daily M2M. 2) Yes, we have to log in every day and place the SL/target order. Unfortunately, no workaround for this, yet. Thanks Karthik, desperately needed continuous data. Thanks for the help. I am trying to trade equity futures (positional trading on a daily time frame) with a capital of 1Lk (94k actually) taking a 1% calculated risk per trade. However, whenever I analyse the underlying stock to initiate a trade, the SL (usually near to a S&R) turns out to be way more than 1% of my capital, leaving me no option but to trade equity intraday (which I don’t want to). 1. Could you please advise whether it would b wise to increase the risk percentage? 2. If not, then what else can I do to trade futures (other than increasing my capital)? Would it be correct to analyse intraday time frames (15mins or 1hr) for positional trades (asking because that would reduce my SL placement) ? 3. How do we draw S&R(s) with respect to price gaps? Should we consider the gap or ignore them? 4. Had requested this earlier, but requesting again…anyway you could setup a module on intraday trading (with live videos perhaps)? And finally, thank you very much. I know..lot of questions…I am sorry (please don’t be mad) 😀 . 2) Have you checked MIS option? Please feel free to ask as many questions as you want. Anyway, sincere advice – start with small quantities of equity, build capital, and then move to futures. I understand when Price are Decreasing then the market is on Bearish side and Shorts must cover. and when Price are Increasing market is on Long side and expecting reversal so Long covering. Please correct me and thanks for clearing my doubt. Yes, Ritesh. This is in line with what we have discussed in the chapter as well. Apologies there seems to be some issue in prnt screen button in my laptop. After going through this chapter My analysis for Nifty tomm. Please advice if my thought process for analysing the market is right or wrong. CALL Strike prices( 10550,600 and 650) – Premium falling and OI increases – which means short positions are buiding up and prices may fall further. Looks to me the market will slide further tomm. Apart from this prices are below 4EMA , 18 EMA and 50 EMA. Range of nifty:- ATR is 99 – Which means upper range is 10756 and lower range is 10558 .So nifty may trade in this band tomm. Shyam, the premium reduces as your traverse from ATM to OTM. Likewise, when you traverse from OTM to ITM, the premium increases. This is true for both calls and puts. 1. Can one buy 5% of open interest at a particular strike price say 10700 CE current month? 2. What is the position of expiry of in the money options now after some nse circular? Is the high STT thing of the past? Eg. 26500 BN CE I buy say 40000 (5% of open interest at this strike) at Re.1 and it expires at Rs.3.5. What is the position? 3. Is day’s Options trading profits allowed as margin for intraday trading for the same day? 3) Options are not settled on a M2M basis, so this is not possible. i have read a book “Alexander Elder – The New Trading For a Living 2014 ” where the the Trade Journals and Record keeping is explained in details so in zerodha is there any option to keep that things in app or any software so that we can keep each and every record of our trade and get to know about the self trading pattern. What does it indicate when a stock shows an increase in Put Open Interest with a decrease in price and an increase in Call Open Interest with an increase in price? IMO, it means that people are going long on CE and short on PE which means a bullish trend. Please correct me if I am wrong? These are empirical observations in the market, Kanika. No concrete science backing this. How to interpret change in open interest. Its best you look at the change in OI with respect to change in prices. I’ve discussed this in the chapter. In derivative Bhavcopy, there is a column : Contracts( column K). What is this and significance? Sanchit, its best you check with NSE for this. How to check with NSE directly? Is there any email id where I can mail with query and they will reply with explanation? Why they are different from Bhavcopy- Change in OI and what does these numbers signify. What is the difference between By underlying and By Contracts? They cannot be different, Sanchit. I’d suggest you check with the exchange if you spot a major difference. Can you provide some insight on Roll over option used in futures using an example? Rollover is very straightforward – you close this month’s position and initiate the same position in the next month’s contract. For example, if you are long 2 lots of Nifty Futures July contract, you close this contract and buy the August contract….effectively, you are continuing on your view. I have a question on commodity market. Possible, Mitesh, since OI is cumulative, gets carried forward from previous day and volume is for the day. What are the indicators for OI trending / tracking at Zerodha Kite? Nothing specific to OI, Venkat. Why the option call premium decays even after the spot price is more than strike price for some stocks…. This usually happens when the volatility is cooling off from elevated levels. Remember, when all else equal, when volatility increases, the premiums increase, when vol cools off, so would the premium. you explained it with much simple way.. Yesterday, OI of OCT NIFTY 11500 PE has increased (..suddenly ) by more than 500% with hardly any change in the price of NIFTY ; How could we interpret this ? 1. Why a stock is banned when the OI crosses 95% MWPL. What is the reason for doing so?What would happen if it is not banned even after crossing 95% MWPL? 2.Why do F&O stocks don’t have circuit limit?What is the reason for not setting a limit for then? 3.If a stock is banned in F&O since because it has crossed the 95% of MWPL, then will its underlying have a circuit limit? 4.I have read somewhere that only swing/position trading after a Ban of a stock will lead to a penalty of Rs.5000.But when a stock is ban period, you will be able to do Intraday trading without any penalty since it does not change the OI. Is it true?Or does it depend on brokers (Do some broker allow to do so and do some don’t)? I am wondering why didn’t you mention anything regarding F&O stock ban in this OI chapter and in entire Future’s module !!! 4) No broker allows, but if you manage to place a trade and that goes through, then there is a fine imposed. In the futures pdf, Open interest section, it is mentioned. Increase ||| Decrease ||| Bullish trend could probably end, expect reversal. Can you explain me the second and fourth point. When Price decrease and OI decrease, How will bearish trend end and will become BULLISH? When all traders are selling how will it become bullish? If it was indeed a real correction, then there should have been associated volumes. Hence, a decrease in price but without any increase in OI means the price decline is questionable. I’d suggest you use the same logic for the other point as well. Thanks a lot Karthik for a quick and fast reply. Appreciate your wisdom and your sound knowledge. Thanks for detailed explanations on various aspects of Stock markets, the jargons & how to read indicators. 2) I am slightly confused on one aspect though. During the week of 10th Sep 2018, i was tracking quite a few stocks which as per the pattern of candlesticks for past 6 months & also the indicators like EMA, Alligator, should have fallen. However, mid-week, all of a sudden, they started moving up. That too quite dramatically. How should one understand or read this? 3) When buying / selling Futures, should one be reading charts of Futures or of underlying SPOT, to identify signals & trading opportunities? And when we do read these signals, should we look at indicators of a Day / Week chart or hourly chart? 1) Its best if you apply TA for short-term, Srividya. 2) Spot charts. I’d suggest you look at day charts. yet another query: What should one do when current month futures is trading at slightly lower value than SPOT & its fair value? And also when the fair value is EQUAL to SPOT price? The Mid month contract also is trading at not such a great premium & CMP of mid-month contract is below its fair value? In both case of current month & mid-month, OI has come down heavily (13% & 9 % respectively) but price has gone up slightly. How does one read these & set up their trading? All these variations gives scope for arbitrage trades, but you need to ensure the spreads are good enough to carry out the trade. Hello Karthik and the whole team behind Zerodha.First of all I will like to take this opportunity to thank you guys for this wonderful initiative.Z Connect/Varsity etc are helping newbie traders/enthusiasts like me a lot.Actually I have a qs related to determining “Support and Resistance Using Options Open Interest Data”.I am stuck on this point.”Max/heavy OI on a given Call option indicates a possible resistance and max/heavy OI on a given Put option indicates an immediate support”for the underlying.Can you please decode it for me in simple terms why?What is the logic behind it.Different websites/forums have different angles to it.Please decode it for me.I am really stuck on this concept.Some websites are saying as option buyers are mostly retail traders and less experienced and proficient and option sellers/writers are more ex and proficient so if one has to bet,bet on the more ex and proficient side as odds of winning go up.Does it makes sense?Please decipher it for me.And please do explain in detail (if possible) why we take the given levels as resistance and support based on OI data. Archit, the general logic is that if a specific strike has a huge OI built up, then the chances of that strike (corresponding spot level) working as a support or resistance is quite high. Remember, this is just a perception and there is no real logic as such (have also indicted this in the article). Thanks a lot Karthik for that quick reply.Just one more very basic level query related to OI and Price analysis.If you have already answered this qs multiple times please provide me the link to it if possible.So my qs is when we say that,when the OI is going up and price is falling it is usually a bearish signal and when the OI is going up and price is also going up usually it is a bullish signal. What is the core logic behind it. As for every option/future seller there is a buyer as well.Is it due to the demand and supply rule or something.What am I missing here.How are we coming to this conclusion of more trades on the long/more trades on the short side scenario,when a seller equals a buyer. Archit, increase in OI means more positions are getting added. So the increase in OI with a decrease in prices means that prices are falling and traders are adding to the position….this implies strength in selling. Likewise, decline in OI means fewer positions getting added hence whatever is the trend in price, may not sustain through. futures 25oct2018 and sell 1 lot of nifty futures 29 nov2018 at the same time tomorrow.is it possible to do two trades at the same time? what will be margin amt? and how change in OI is important ? With every new position getting added to the market, the OI changes. The change in OI on a standalone basis is not so meaningful, hence traders associated change in price to this and draw conclusions. I’ve explained the same in the chapter. Could you please explain how come value of change in open interest be higher than the volume in option chain of nifty.? I guess we had this discussion earlier in the comments. Can you please refer to that? a. Is there an upper limit on the amount of OI that can build up on a derivative. Is this controlled by the regulator? b. When you say increase in price in the tables above – Is it increase in premium price of the option? c. If premium price increases with an increase in OI, does it mean the underlying stock price also increases? Are they directly proportional? c. Again, this is not about the option premiums. In above table (ie. Tuesday count) I think Neha’s count should be 2S and in the Sell column. Not 8L. Correct my understanding that Neha is simply transfering her 8 position out 10 to John. So still she is short with 2 contracts. Nino, I believe you misread the Buy/Sell column. It only denotes that the position initiated on Tuesday, which is 8 Buys, effectively to cover 8 out of the 10 short positions. The last column reads the contract held at the end of that day which is 2 Shorts. Can you guys add greeks data points ( Delta, Theta, Gamma, vega) in the options scrip price by creating a tab along side. This would really help. if not all, delta is must. Is it possible to check change in open interest in real time. Suppose at 10.00 AM, there are 2000 open contracts. At 11.00, these are changed to 2200. So there is change of 10% in OI. Now at 11.30, these contracts are changed to 2420. So again there is a change of 10% in between 11.00 -11.30. Is it possible to check open interest data this way. Thanks for the reply. I have checked the link, however it shows OI data change from previous day.. not intra day..
Also it is OI data for options.. I need it for futures.. If I am not wrong, these two are different.. I need info on how many contracts are open in futures in a script and how these are changing every hour. Is it possible to get it? Thanks again and have a nice day. Happy diwali to you and team zerodha..
Sir i have noticed oi of lt in dec and jan contracts are up by 300-500% and price is also increasing..now how to intwrpret this..if traders are bullish why not buy the current months contracts? Is it Indication of bullishness in long term?? Maybe the traders have a slightly long-term opinion on the stock. Btw, is it the Futures OI or Options? sir it is futures…even jet airways oi futures up by 100% in jan 2019 contracts. This explains. Perhaps, traders expect some sort of relief rally in Jet hence bought into 3rd-month futures. Evident with the increase in OI. But my que is why not buy current month contracts? is there any reason for buying far month contracts? or are they used for hedging purpose? Far month contracts have maturities 3 months later, so there is no need to roll over month on month. In the above example, since Neha already went short on 10 contracts she held on Monday, then how come she has any contract left for Tuesday? Additionally, the below line confuses me as it seems she has already gotten rid off the contracts she held. Tuesday: Neha wants to get rid of 8 contracts out of the 10 contracts she holds, which she does. Amit, the example states that out of the 10 short, she bought back (squared off) 8 contracts. By doing so she just transferred 8 contracts to John, so no new contracts are initiated, it is just a transfer. Hence OI remains the same. The square off results in the netting off the entire contract, Alok. Hence the OI reduction. Ok…since both of them decided to square off..the OI decreased. Thanks. Also, is there any way to know if OI increase is on account of a long initiation or short initiation. No, that would be really hard. You can, however, check the OI of calls and puts to get a sense of this. On call side Price decreases and OI increases the market has Bearish sentiment but if same thing happens on put side what would be the market sentiment?? Yes, thats right. You will have to look at the price, OI/volume in conjunction. Yes, the interpretation is the same for both calls/puts/futures. why open interest is not zero on futures contract expiry day ? You will have to check this end of day. Thanks Sudheer, I’ll pass the feedback. I have read your modules on tech analysis and futures trading, and they are simply awesome. Thank you for your kind work sir. I just have one doubt. I am not able to understand as to how to trade in oil futures as in do i use the tech indicators like candlesticks, RSI, MACD, Bollinger Bands or do i use macroeconomic events and news to place my trade. Even if i use both then should i give more importance to the technical indicators or macro events or what should be the optimal trading strategy for it. Nakul, for commodities, I’d suggest you stick to technicals. Getting a grip on the fundamentals of commodities is quite a task. Starting with Thanking you Once again!! I have few queries as below. Request if you can clear these doubts. 1. You told a concept of Spread and how we can utilise that to make profit. How often we can see those situations where the spread between the spot and future is significantly high? 2. Does the future expiry date remains same for all the future derivatives? e.g. TCSJanFuture and JETAIRWAYSJanFuture will end on the same day? 3. You talked about “rollover”, In case I want to rollover then do I need to sqroff my position on Expiry Date and Buy the Next Future or that happens automatically if I just don’t do anything? 4. Does the lot size changes for any future? E.g. If TCS has a lot size of 125 shares then will it ever change or will always remain same? 5. As future price moves with the spot price. So any buying or selling opportunity can be found using the TA of individual stock itself or do we have any other ways of TA for future please? 6. The beta of a stock generally will be daily with 30days, weekly with 90 days and many others. Which one should be considered while taking a trade? Too many queries I believe. Sorry for that however request your help please. 6) 90 days is good. REJECTED WITH RMS RULE MENTIONED ABOVE PLEASE EXPLAIN THE REASON???? I wanted to know if something is needed to be done in order to roll over a futures contract (Long/Short) into subsequent Months/Series’ or is it the system that rolls it over automatically if not squared off. Please let me know what is to be done in order to roll over a contract into subsequent months (if the system doesn’t auto roll over) on Zerodha platform. Kiran, you will have to do this manually by squaring off the current month contract and initiating the same position (same quantity) in the next month. even though it is said that futures price mimics spot price, I have often found spikes in intraday futures price of stock futures which are not to be seen in the spot price? Why is it so and how can we avoid it? This is because of the individual contract’s demand and supply situation. Although these spikes occur, it does not really stay that way. It means, if i buy 10 lot in future march series and sell 10 lot of immediate OTM call option of march series, open interest should be 20 lot. I use nest trader wherein i see open interest of curr date, does it consist of both option and future. Option is generally use for hedging/writing den why link option data with future? Why the strike price wherein OI in call side is maximum, is called resistance. Pankaj, it would be 10 lots OI in Futures and 10 in options. Option is generally use for hedging/writing den why link option data with future? —–> Options is also used for speculation and arbitrage. Thanks karthik. It means OI for futures and option is measured separately. I use nest trader software let’s say for any particular stock my filter for long buildup (in future) is (+) 7% change in OI and (+) 1.5% change in price. Suppose at particular time, i link this filter with option chain for that particular stock then it is meaningless to retrieve some view/trend. Yes, because the OI for futures is different from OI for options. Where to find OI chart for Indices as well as stocks that’s plotted in simpler way? I need for mobile only. Both In kite & some other apps or link ?? You can check the OI information on Pi, it is presented as a number. I have 1 doubt.. When you say OI as 1 unit.. So in case of future it is easy to think as 1 unit but what about options? We have 2 option CALL and PUT.. So how does 1 unit defined in that.. Is it ok to consider 1 unit as someone sells it in CALL and buys in PUT or vice versa. Also, how do you relate it to strike price. Like a selling at 1 strike price and buying in on same or other strike price.. Is it also consider a single unit? That’s still ok, Tushar. Look at option OI at a strike specific interval. This will give you a better perspective on OI. So if i consider an example for today option data..
On same strike price i see in call side Call writing (sell) is happening and on PUT side short covering is happening (buy).. So can i consider this as 1 unit..? No Tushar, these are two different option types. You cannot combine the OI. oh Thanks.. Its cleared my doubt.. I need to see in same option type.. I have 1 more question related to Index Future/Option.. When we are saying that net position of FIIs are positive in Index Future so that means FII purchased Index Future or short Index future… and When there position is negative in Index Future that means they have square off their position… Or in case of short Index Future FII position would be negative.. Same on Index option.. When we say there position is positive than that means either they have buy the call or put or short it.. in case of negative net position than that means they have square off their position (long unwinding or short covering) .. The net position is indicative of the total buys minus the total sells. If its positive that means they are net buyers, if negative it means they are net sellers. In options, its on a strike wise basis. Can we see OI option in Zerodha Kite platform? I think in this module 12.2 OI and volume interpretation there is a typo error!! Please look into the table price, volume and trader’s perception table. Please correct me if I’m wrong!! Let me check, Harsha. But a cautious stance is what should be expected.